Earlier this year, when it was reported that Amazon had invited a group of customers to undergo twice-monthly full 3-D body scans, there was speculation that the e-commerce giant was working on technology that would let shoppers virtually try on clothes before buying them. 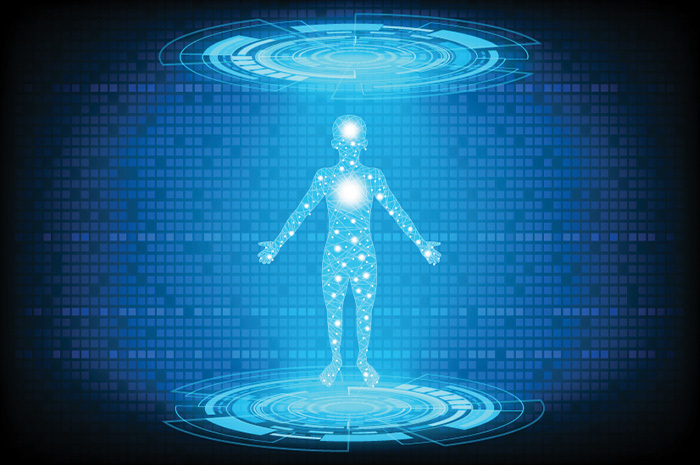 Use of body-scanning technology in retail is picking up pace. Last year, for instance, San Francisco start-up RedThread began offering custom-made clothes for women based on 3-D scans. It’s easy to see the appeal to retailers. Better fitting clothes mean happier customers, right? Well, maybe not, warns Jessica Ridgeway Clayton, an assistant professor of retail entrepreneurship at Florida State University. 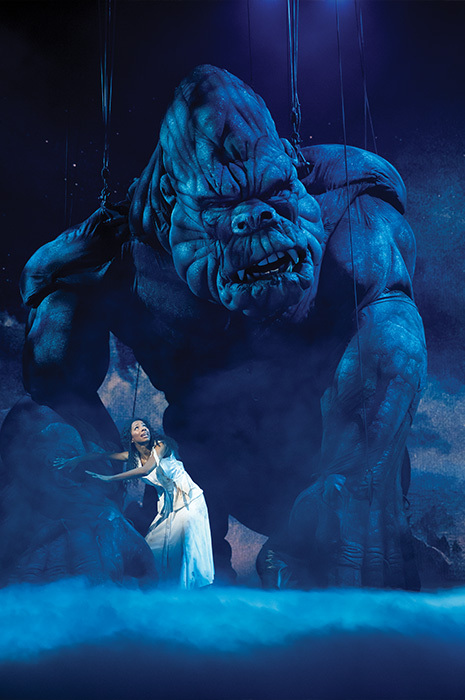 Writing in a recent edition of The Conversation, she pointed to her research published last April that found when people see a 3-D scan of themselves “it makes them feel sadder and worse about their appearance.” Ridgeway Clayton notes that people rarely see themselves in 3-D—even mirrors and photographs are 2-dimensional. When they do, they’re often not pleased with the result—which probably won’t put them in the mood to buy new clothes. – T.G. – T. G.
Solar energy is usually collected by panels that transform it into electricity for either immediate use or storage—usually in batteries. But scientists in Sweden have come up with a liquid they dub solar thermal fuel that can store solar power for up to 18 years and be used over and over again, both NBC News and Science Alert report. NBC says the fluid packs 250 watt-hours of energy per kilogram, double the capacity of Tesla’s Powerwall batteries. The fuel could become a way to store solar energy, then use it to generate heat instead of electricity. The fluid contains a single molecule composed of carbon, hydrogen, and nitrogen. When exposed to sunlight, the bonds between the molecule’s atoms rearrange themselves, a process that traps heat energy from the sun. To release the heat, the fluid is pumped through a cobalt-based catalyst that forces the molecule back to its original formation. 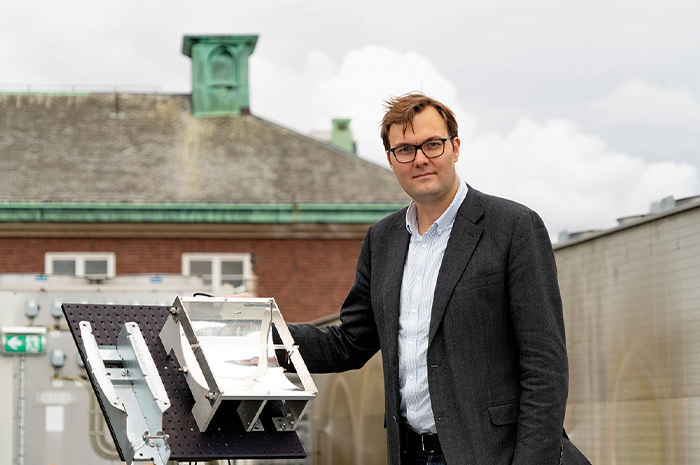 To make use of the fuel, researchers at Chalmers University of Technology devised a rooftop energy system that includes a concave reflector attached to a pipe. The reflector tracks the sun and captures its energy, which heats the solar fluid in the pipe. The hot liquid is then stored until needed, when it’s pumped through the catalyst and put to use—for instance, to heat a home, office, or hot-water heater. The solar fuel is then repumped through the system to be heated and stored again. If the liquid is initially at around room temperature, the system can warm it to 183º F. And the researchers think they’ll soon boost its maximum heat to 230ºF. Hot stuff. – T. G.
Global navigation is very reliant on GPS, which uses satellite signals for tracking. But GPS has its limitations and weak spots. There are areas around the world that can’t receive a GPS signal. And the satellite transmissions can be intercepted, blocked, masked, or hacked. That’s a problem for military sea craft, particularly nuclear submarines, which are meant to avoid detection. So Britain’s Ministry of Defense spent millions of dollars and three years on a project to develop a tamperproof navigation device that doesn’t use GPS, the Financial Times reports. 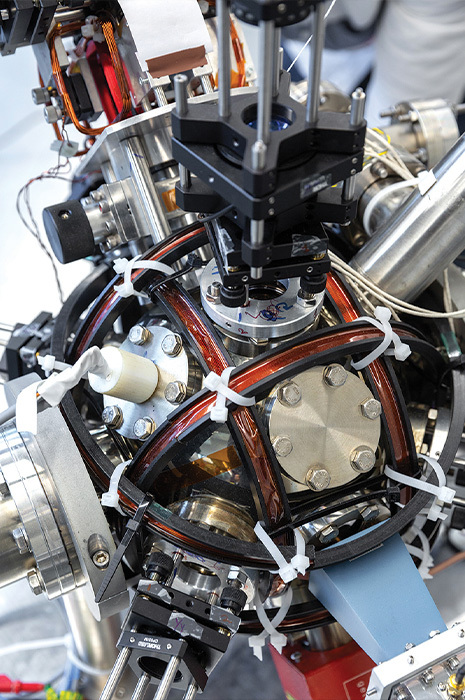 The result, built by Imperial College London and M Squared, a photonics and quantum technology firm, is a world first: a quantum “compass,” which is actually a quantum accelerometer. An accelerometer measures how quickly the speed of a vehicle changes in time. “If you know that, then by some simple mathematics you can work out what the position of the vehicle is,” says Imperial College physicist Ed Hinds. All smartphones and laptops have precise accelerometers, but they need frequent recalibration and can only be used for a few hours at a time. The quantum device, however, can run nonstop. 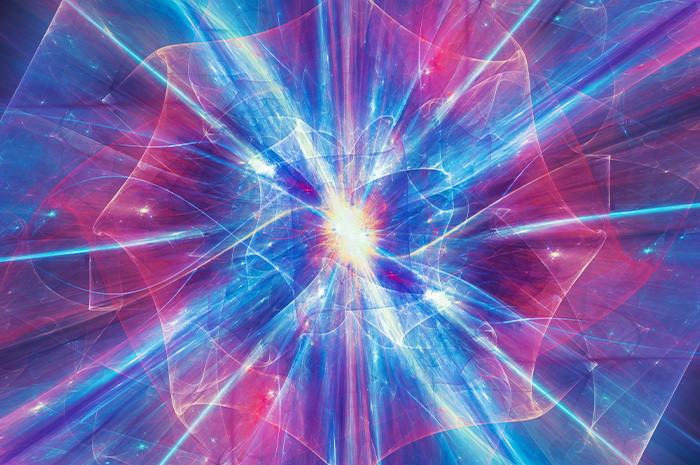 Using powerful, custom-made lasers, the device cools atoms to temperatures close to absolute zero and then measures their quantum wave properties as they respond to the vehicle’s movement. It emits no signal that can be detected. – T. G.
Thanks to the Internet, we all struggle with information overload. In particular, scientists trying to keep up with what’s new in their fields confront a deluge of data in the form of some 2.5 million published journal articles a year, Axios reports. Now, computer science is coming to the rescue with algorithms that can quickly burrow through thousands of papers and highlight the most interesting. A Twitter data scientist has launched PCA News, a feed that searches for tweets about papers related to artificial intelligence, then scores them on likes, retweets, the quality of replies, and the influence of the account, Axios says. Meanwhile, the popular academic search engine Semantic Scholar is now placing tweets, videos, presentations, news stories, and computer code next to results. 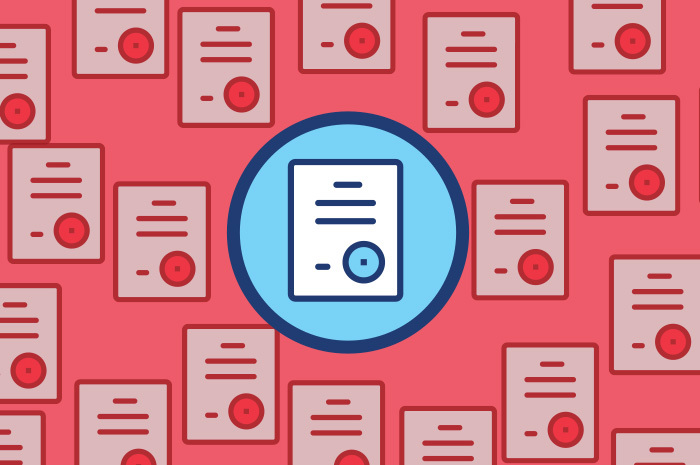 Leapfrogging the traditional peer-review system, these efforts boost research that gets a lot of online buzz. But Axios also points out that replacing peer review with social media risks creating an ivory tower echo chamber that highlights only those researchers with large Twitter followings. One start-up, Assert, is trying to sidestep that problem. Launched by Mikey Fischer, a Stanford Ph.D. student in computer science, it shows 10 papers at a time. While it does score them based on reaction from influential Twitter accounts, it also solicits other feedback: Readers can rate papers on quality, leave comments, and ask authors questions. – T. G.
Neuromorphic supercomputers don’t work like their traditional peers. Instead, they’re built to mimic the human brain’s huge parallel communication architecture, which sends billions of small chunks of information simultaneously to thousands of different destinations. 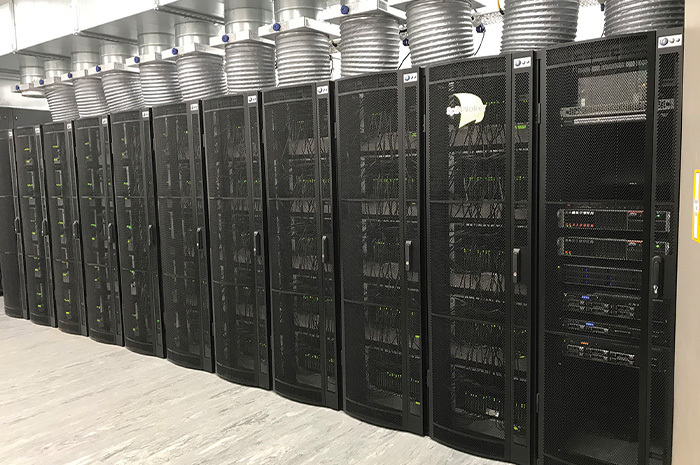 Early last month, the world’s largest neuromorphic computer was finally switched on, some 20 years after it was first conceived of and more than a decade after construction began. Designed and built at the University of Manchester’s School of Computer Science, the $19.5 million SpiNNaker supercomputer contains one million processor cores, with each chip containing 100 million transistors. It can handle more than 200 million actions per second. The goal is to eventually model up to a billion neurons—brain cells—in real time. That’s around 1 percent of the total number of neurons in a human brain. SpiNNaker should help neuroscientists unlock some of the mysteries of the human brain by running large, real-time simulations that could lead to neurological breakthroughs in treating a host of ailments. It will also be put to work as a simulator to help roboticists design improved neural networks in mobile robots. – T. G.
Some promising medical therapies can be hard to deliver to parts of the body that need them. For instance, molecules designed for gene therapy are often difficult to insert into the cells that need to be manipulated. The walls of human immune cells are particularly tough to penetrate. Two methods for opening cell walls—electroporation, which uses an electric current, and viruses—turned out to be risky. Five years ago, a team of materials science and engineering researchers at Stanford University began working with nanostraws—“tiny glasslike protrusions” that pierce cell walls—to solve the problem. In their initial tests, they placed animal cells on a bed of nanostraws, then subjected them to electroporation. The procedure worked. The nanostraws concentrated the electric currents into very small spaces that opened pores in cell walls just big enough for a molecule to squeeze through, but without causing any serious damage. In a new paper, the team has now shown the method works with three types of human cells and mouse brain cells that are all hard to work with. It again proved to be more precise, faster, and safer than other methods, and killed fewer than 10 percent of the cells. Next step: to see if it works with human immune cells. Meanwhile, German researchers at the Max Planck Institute for Intelligent Systems may have found a better way to deliver medicines to the retina using microscopic glass corkscrews and microscopic robots. – T. G.
Solar sails are a means to propel a spacecraft by using the radiation of the sun. Some aeronautical engineers argue that solar sails could one day be an efficient, economical means of sending spaceships to distant planets. Three years ago, Purdue University students successfully sent LightSail, a CubeSat mini-satellite, into orbit, where it was powered by a solar sail. But once LightSail was in orbit, it could not be controlled. The project is now readying LightSail 2, which will be able to change its orbit by controlling its orientation to the sun, says David Spencer, an associate professor of aeronautics and astronautics. The LightSail 2 CubeSat will be dispatched some 450 miles above Earth early next year, when it hitches a ride aboard a SpaceX Falcon Heavy rocket. 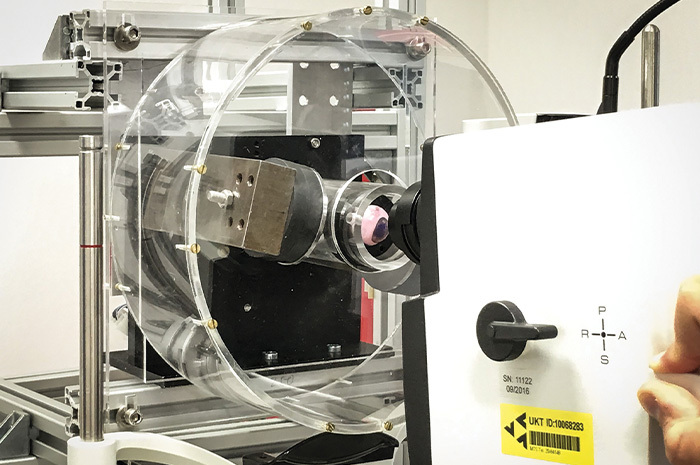 SpaceSail 2 has a momentum wheel to control the sail’s direction, while reflectors on the CubeSat allow the team on Earth to use laser ranging to precisely measure its orbit determination. 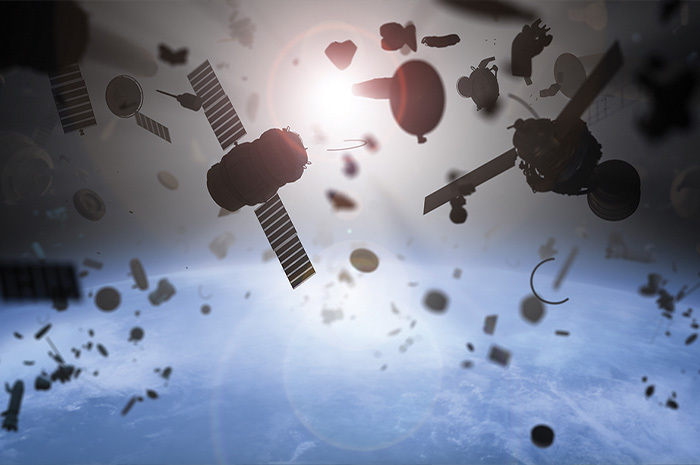 The tiny satellite was designed so that, after a month, gas particles in the atmosphere will increase drag on the sail, allowing its orbit to decay. LightSail 2 will eventually reenter the Earth’s atmosphere, where it will harmlessly burn up and not add to space junk. – T. G.
Back in the 1960s, “electric mushroom” might have been slang for a popular psychedelic drug, psilocybin. Fast forward some 50 years, and researchers at Stevens Institute of Technology in New Jersey have created an edible white buttom mushroom that actually generates electricty. Their bionic fungus is covered in 3-D-printed clusters of cyanobacteria, which obtain energy from photosynthesis, and whirls of graphene nanoribbons. Bioengineers have long known that cyanobacteria can produce electricity, but efforts to put that property to use have been thwarted because cyanobacteria die off quickly when placed on artificial surfaces. The Stevens researchers correctly theorized that mushrooms—which naturally host a rich microbiota—could provide the nutrients, moisture, pH, and temperature to maintain the cyanobacteria for several days longer. 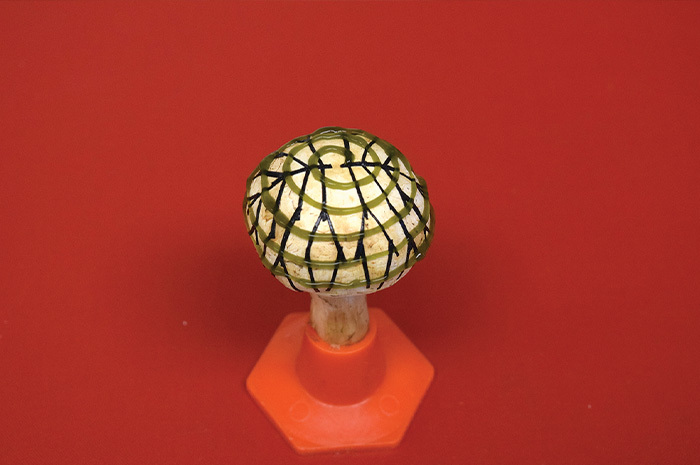 To create their bionic mushroom, researchers used a 3-D printer to manufacture a network of graphene-infused nanoribbons to collect the cyanobacteria’s current and covered the ’shroom with bio-ink containing the cyanobacteria. The researchers say the bionic mushroom proves the concept of biohybrid bacteria—microbes integrated with nanomaterials to make useful products. Biohybrids based on bacteria that can glow, sense toxins, or produce fuel potentially have environmental, defense, and health care applications. – T. G.
Is a piece created by artificial intelligence considered art? That question was raised in October when Christie’s auction house sold Portrait of Edmond Belamy, created by a machine-learning algorithm, for an eye-watering $432,500. French AI research studio Obvious used an algorithm called GAN—generative adversarial network—to comb through a data set of 15,000 portraits and generate a print on canvas that could not be differentiated from the others in the data set. The result is a blurry-faced fictional subject. 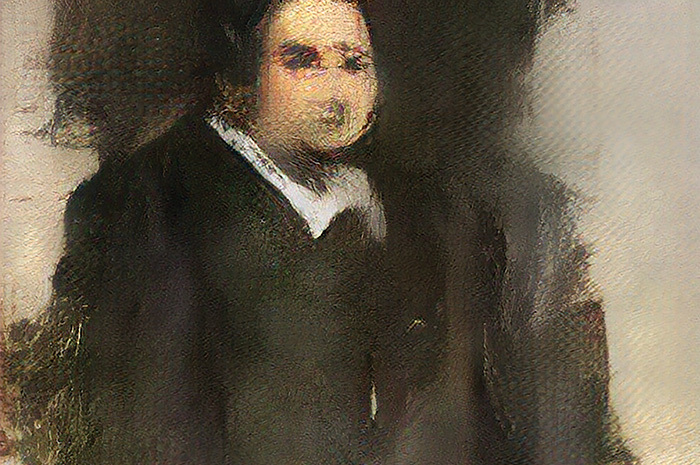 Ahmed Elgammal, director of the Art and Artificial Intelligence Lab at Rutgers University, tells Vox that AI-created art’s merit is in the process. “What you have is something more like conceptual art than traditional painting. There is a human in the loop, asking questions, and the machine is giving answers.” Gauthier Vernier of Obvious, however, tells Time that the whole idea behind AI art is that humans have “as little input as possible.” It raises the question of who is the artist: the algorithm, the person who uses it, or the person who invented the code? The algorithm Obvious used wasn’t written by the men who own the studio; it’s the work of Robbie Barrat, a 19-year-old AI artist who shared his code on the Web. Barrat tells Vox he doesn’t want any of the sale’s proceeds, and Obvious didn’t say whether it would split its profits with Barrat. – T. G.
Hydropower was long seen as a clean, green alternative to fossil fuels for generating electricity. That was reassuring, since it accounts for much of the world’s renewable energy and 6 percent of U.S. electricity. 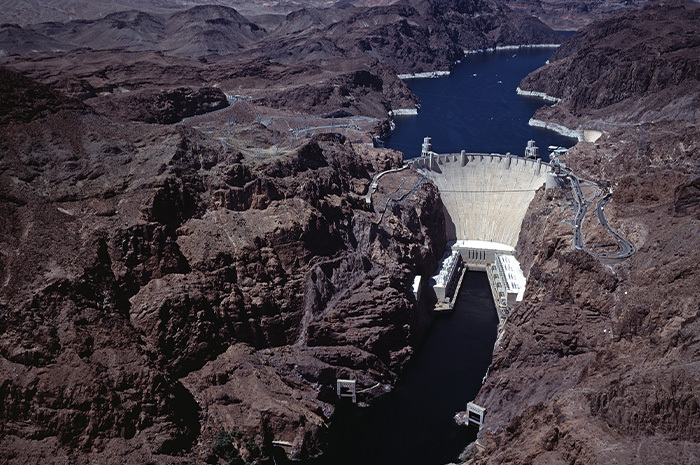 But a new Michigan State University study finds that in the industrialized West, more dams are being dismantled than built, the BBC reports. In the United States and Europe, dams are being torn down at the rate of one a week. Why? Governments have come to realize that the environmental and social cost of damming rivers overrides the prospect of inexpensive electricity. Dams, the report says, have damaged river ecologies, displaced millions of people, and contributed to global warming because greenhouse gases are released from the decomposition of flooded lands, the BBC says. However, the study warns that many developing countries are ignoring the harmful effects of hydropower and are ramping up dam construction. An estimated 3,700 new dams are planned for Africa, Asia, and South America. The biggest of these projects, the report says, could cause irreparable damage to major rivers, including the Congo in Africa, the Mekong in Asia, and Brazil’s Madeira River. “Large hydropower doesn’t have a future. That’s our blunt conclusion,” lead author Emilio Moran, a professor of anthropology, tells the BBC. But for nations lured by the promise of cheap electricity, the consequences be dammed. – T. G.
Medicare, which covers 54 million Americans over 65 and accounts for 20 percent of U.S. health care spending, isn’t immune to waste, fraud, and abuse. Dodgy claims cost the system anywhere from $19 billion to $65 billion a year. 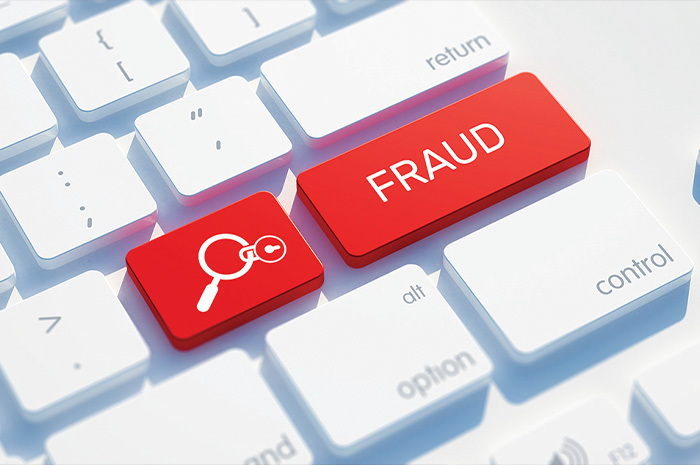 Now researchers at Florida Atlantic University’s College of Engineering and Computer Science have devised a sophisticated, machine-learning algorithm that can comb through Medicare Part B data sets and flag potential cases of fraud. They began with a data set containing 37 million cases, spanning the years 2012-15, but aggregated it down to 3.7 million cases. Part B data include provider information, payments and charges, procedure details, and the medical specialities of providers. They cross-matched that data set with data from the National Provider Identifier, a federal government system that issues I.D. numbers to health care providers. That exercise was to determine if physicians were claiming to have provided services outside their area of expertise. For instance, if a provider is identified by his NPI as a dermatologist, but the Part B data say he’s a cardiologist, that might indicate something is awry. Of course, problems in records are sometimes clerical errors, not fraud. The researchers say they hope the algorithm can flag cases that seem suspicious so investigators or auditors can examine them more closely. And that could help reduce the amount of money lost to deception. – T. G.
If you imagine intelligent life exists elsewhere in the galaxy, you may be intrigued by the idea of sending a signal to faraway corners of the Milky Way that screams: “Hello, we’re here!” James Clark, an MIT aeronautics and astronautics graduate student, says it’s possible to transmit such a signal using available technologies. In a recently published “feasibility study,” Clark says sending a high-powered laser beam focused through a huge telescope into deep space would do the trick. The resulting infrared radiation beam would be detectable despite competition from strong infrared rays radiating from the sun. Clark determined that a 2-megawatt laser aimed though a 30-meter telescope would produce a signal that could be detectable as far away as Proxima Centauri b, a planet 4 light-years away. A 1-megawatt laser shot through a 45-meter telescope would produce a signal that could be seen as far away as TRAPPIST-1, a star 40 light-years from Earth that’s surrounded by seven exoplanets. There’s one big drawback. While the beam would be invisible, it could damage the vision of anyone who inadvertently looked at it. It could also possibly screw up cameras aboard any spacecraft that flew through it. Clark suggests that placing the beacon on the far side of the moon might be a safer option. – T. G.